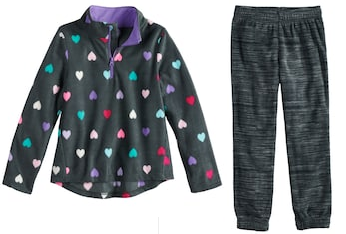 Kohls has 12 different Jumping Beans brand fleece pullovers and pants on sale for just $4.99 (regularly $16). There are 7 different tops and 5 pants each available in multiple colors. Additionally, now through November 6th, save 20% off your entire purchase when you use the code GOSAVE20 at checkout or if you are shopping in-store you can print a savings pass, bringing your price down to just $3.99. Also, today only, you will get $15 in Kohl’s Cash for every $50 you spend. Your earned Kohl’s Cash will be redeemable November 2 through November 15.